The Namwon plain of Jeollado is the largest, flattest part of Korea, what has made Jeollado the rice bowl of the country for so many years. 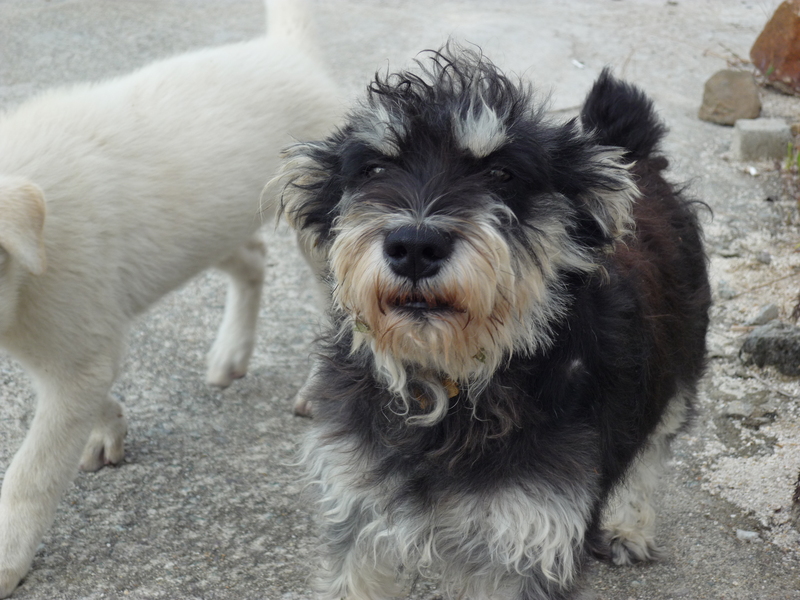 The fields were almost fluorescent yellow-green, vivid even in that graying day, and when we stopped to take photos of the graceful rice and the blue mountains beyond, we found a laid-back farmer and his puppies running around. We didn’t stay long. We wanted to stop at the Boseong green tea plantations before driving on to Gangjin and then Mokpo. 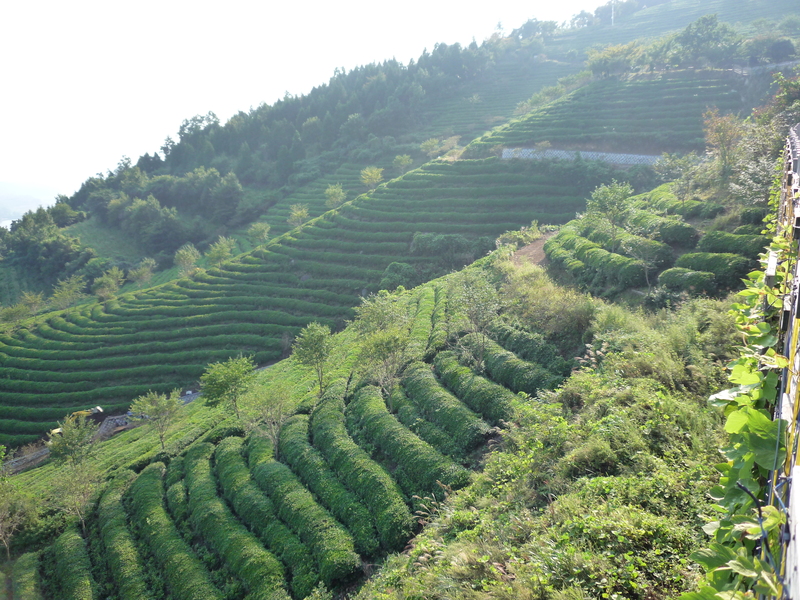 The green tea grows on low mountains in neat, rounded rows marching up and down the slopes. At that point, what was left was the cheapest of the cheap—it would be turned into soap and other “green tea” products—but we were still able to drink a cup of the second-best harvest, from mid-April’s young leaves. The road to Gangjin was even more pastoral. There were pink and white cosmos flowers everywhere, their happy faces turned upwards, and slender trees planted on both sides of quiet roads, rising up over our heads, so that we were entering a storybook (or a Korean mini-series) every 20 minutes or so. We even saw palm trees, young and looking a little shocked to be in Korea but oddly charming, despite the sad assumption that global warming is a done deal. It was pretty, it was calming, it was benevolent human power over nature. And then we drove into Mokpo and ate our octopus live. 산낙지, sannakji, or live octopus isn’t technically “live.” They cut up the octopus while it’s still alive, but what’s presented on the plate are octopus pieces, mainly tentacles. They still wriggle, but I imagine it’s residual nerve activity, like when a chicken runs around after its head is cut off. At least that’s what I told myself. And that it was really Carolyn’s idea. 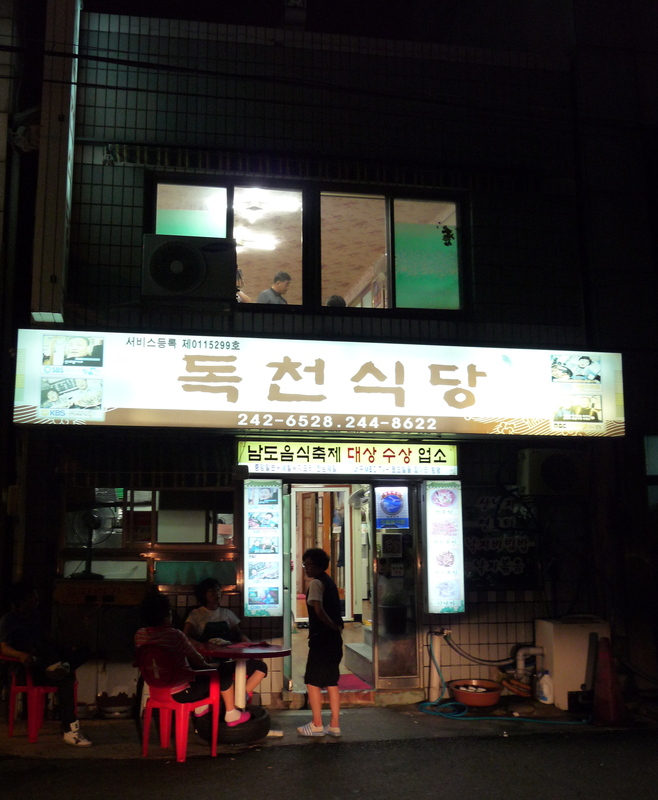 We had decided to go to 독천식당, Dokchun Shikdang, one of the most famous octopus restaurants in Mokpo. (The URL of its website means “octopus land.”) On the first floor were tanks displaying what we would eat. We had to climb a narrow set of stairs to get to the shoeless dining rooms, which were dingy but clean, with rose-printed wallpaper put up haphazardly and uneven flooring. Still, it was packed, and looking at the menu, listing various octopus dishes and nothing else, I started to feel giddy with anticipation. 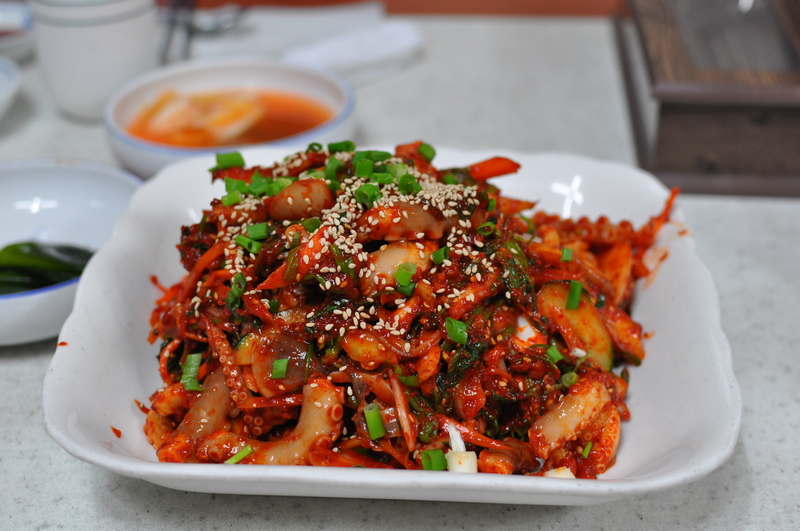 The 낙지무침, nakji-muchim, a cold salad of lightly cooked octopus and raw vegetables was perfect, tender where it should be, crunchy where it should be, and never ever rubbery. It tasted fresh and clean, with a tang that made the spiciness more refreshing than hot. The 낙지볶음, nakji-bokkeum had the deeper, more caramelized flavors that come with cooking. 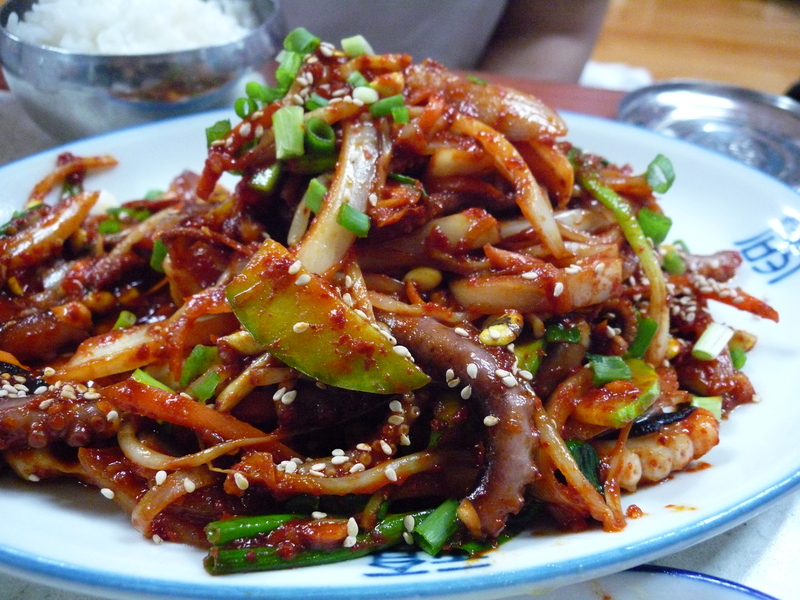 The octopus had been stir-fried, also in a spicy sauce but with the darker heat of gochukaru or red pepper flakes rather than gochujang, red pepper paste. This kind of spiciness was more warming than invigorating. I liked the muchim better, but the bokkeum was very good. Most of all, I loved the 연포탕, yeonpo-tang, or baby octopus soup. 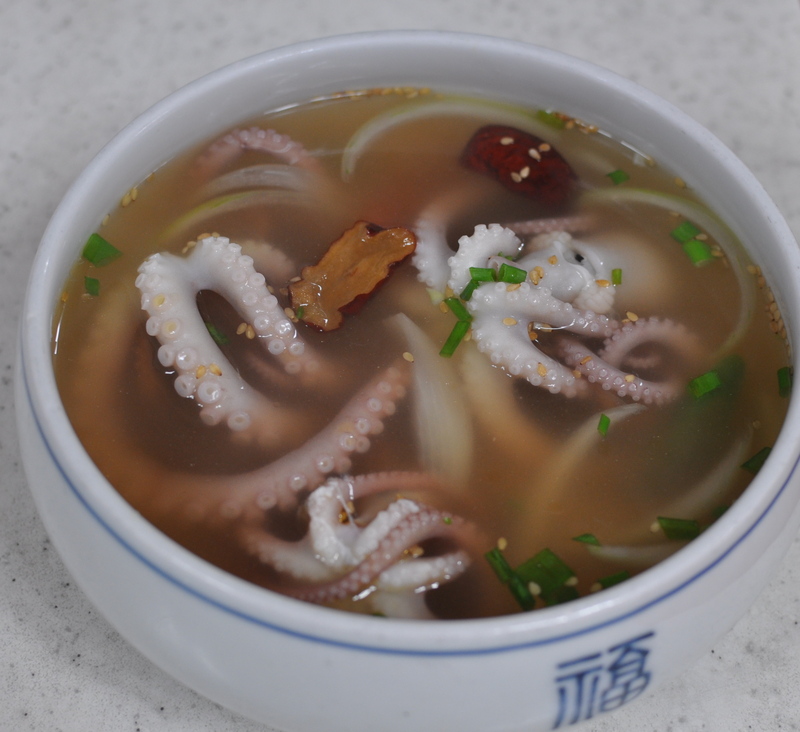 The soup came in a simple bowl, the octopus sitting whole in a clear broth with just a few slices of jujubes and scallions. Right before serving us, the waitress took a pair of scissors and hacked the octopus into pieces. Again, the octopus was perfectly tender and the soup was practically luminous, with that perfect clarity of flavor I love in all seafood-based broths and a subtle heat from fresh chiles. The soup was what Koreans call “refreshing,” because it clears your head (and your nose). My mother told me this dish can only be made with fresh live octopus, which is why yeonpo-tang you might get in Seoul will never taste as good as what we had in Mokpo that day. As for the live octopus…it arrived on a thick plastic plate. The tentacles were definitely wriggling and squirming. One piece managed to get off the plate and looked like it was trying to run away, which was almost harder to bear than anything else. But once we decided we were going to eat them, the hardest part was picking up a piece, and I don’t mean psychologically. The suckers gripped the plastic plate with a stubborn tenacity. They brought us wooden chopsticks to help us get a better grip on them, but it didn’t make much of a difference. The verdict? They were okay. The octopus was dressed in sesame oil, sesame seeds, and scallions, and we were given some spicy chojang to dip the pieces in, but the flavor wasn’t really that different from fresh raw octopus that lies still on a plate. I’ve heard people say that you can feel the tentacles wriggling as they go down your throat, or the suckers trying to hold onto your tongue, but I just bit down on each piece and couldn’t even feel a textual difference. It also wasn’t quite the season for live octopus, but I can’t say that I’m clamoring to go back at a better time. I like my food to be food rather than a process by which I can feel virile and strong. This was a dish that was so much more about the eater than the eaten. The next morning, we visited the Maritime Museum in Mokpo. It’s a nice museum with impressive artifacts recovered from underwater excavations of shipwrecks along the southwestern coast. You can see the skeletal hull of a ship taking up a cavernous room, miraculously intact ceramics from the famous kilns of Gangjin, and shriveled up black peppercorns and cinnamon sticks that have somehow managed to stay intact over a thousand years in seawater. Diane’s mother is an expert on Korean ceramics, and one of her former students invited us to come visit the Maritime Museum’s restoration offices, where we could see the newest discoveries. We held in our hands shards of pottery from centuries ago. We peered at sticks of bamboo with Chinese characters still visible on them, receipts showing what had been ordered and by whom. We even saw rice, a thousand years old, that had turned black but was still visibly and surely rice. It reassured me in a way, to think that we still eat what they did. But it scared me a little, too, to think of all the people who had loved and cared about life as much as we do who are now completely gone, with only a stick of bamboo left to mark that they lived. I think this is why I can’t bring myself to judge those who savor the flavor of still-wriggling octopus. It’s pretty macho, and I’ve heard octopi are intelligent creatures, who have even been accorded “honorary vertebrate” status in the United Kingdom. But life is hard, and compared to the effort it takes to eat a steak, at least eating this animal, this way is a struggle. I think I understand, at least a little, the desire to feel that in some things, you will prevail.